Moulin: 5 bedrooms,sleeps up to 11. Baths: 4. Known by the village as 'The Château in The Valley', Le Moulin de Mesterrieux, is a romantic 15th Century water mill and Separate Bake House which share their 'island', (the river surrounds the property like a moat), with the separate maison de maitre. Fully refurbished, Le Moulin offers luxurious accommodation with well equipped kitchens, beautiful bathrooms with roll top baths, bedrooms with four-poster and antique beds. Set on two floors, Le Moulin boasts original features such as stained glass windows, open log fireplace, oak floors and beams complement the stone walls. The swimming pool and lounging pavilion face the river with its stunning view of the medieval bridge and waterfall. Fishing, canoeing, cycling, walking, horse riding (riding school 5 min drive), tennis (3 min drive), table tennis, private 'beauty spot' picnic/BBQ area on the river. The area is rich in history: : The original 13th C Moulin once was an important landmark which produced grain and bread for first the Benedictine Abbeys of nearby La Reole and Blasimon and then generally locally. For over three hundred years Henry II and Elenor of Aquitaine, Richard The Lionheart and The Black Prince held court at the castle at La Reole and would have crossed the river over the ancient bridge which can now be viewed or fished from privately on the land. The present Moulin entertained 'Good King' Henry IV of France who is known to have liked to stop here to be served his favourite fish, as he made is way to and from his palace near Agen to Bordeaux or beyond, perhaps with his devotee, great philosopher Michel de Montaigne, who's château can be visited 30 min away at Castillon.The famous astrologer and apothecary, Michael de Nostradamus, would also have made his way from Agen to Bordeaux along this way, and the pilgrims of The Route de Compostella passed near here. Ground; original mill room which opens out to face the millpond. Entrance: Original kitchen with log burning Rayburn, fridge, boot room. 1st floor; elegant dining room seating up to 12. Kitchen/breakfast room with Falcon range cooker, fridge/freezer, dishwasher, microwave, coffeemaker,, toaster, 'french' oven and full range of cookware. Salon with seating for 14 with original stone log fire, 'Juliet' balcony overlooking garden, T.V. with free box,and dvd player, HiFi, WiFi. Bedroom with double antique bed. Bedroom with single antique bed. Laundry room with washing machine and shower room. WC. Bedroom, with king size four poster bed, en suite bathroom with roll top bath and shower. Bedroom with king size four poster bed, en suite bathroom with roll top bath and shower. Master bedroom with super king four poster, antique double bed, study in 'keep', en suite bathroom with oversize bath and shower. All rooms with views of river or millpond. Walled garden with private dining area under pergola and BBQ. Large stone swimming pool with lounging pavillion, sunbathing area, table tennis and trampoline. Tennis court available 3 minutes drive or cycle away. Private fishing on 'lake' with waterfall and river and picnic areas with firepits. Canoeing. Horseriding at stables 5 min drive away through forests and vineyards. Walking on river track or up in vineyards. Large car park. Gated. Cots available. Places to visit include: : Within easy reach of Bordeaux, (50 min drive, 30 min by train), it is a must to visit this elegant city with it's bars, restaurants, great shopping, opera house, museums, night clubs and even a UGC showing films in English. Go 30 min further and you reach the Atlantic Coast and the beautiful Bay of Arcachon. Saint Emillion, one of the world's famous Grand Cru wine centres is 40 minutes drive. Nerac, The Nostradamus Restaurant, where he once lived, at Agen or The Walibi theme park. The Dordogne is on the doorstep, as is The Perigord, with it's gorges, caves, castles and adventure parks.Restaurants nearby; Aux Fontaines La Reole, Les 13 Cloches Monteton, L'Imparfait in Bergerac, Les Remparts in the Cathedral Town of Bazas, Le Bio in Langon on the way to Bordeaux, are to name but a few.Eymet is a picturesque Bastide on the way to Bergerac, so is Issigeac, both with good eating. There are night markets in summer, medieval fairs and a spectacular re-enactment of the last battle of The Hundred Years War at Castillon in July and August.There are lakes, forests, vineyards, castles, chateaux....The diversity and beauty of the area is breathtaking--we think there is nowhere better in the world to live. All en suite bathrooms have roll top or oversized bath and shower enclosures. They are situated on the top floor. Separate wet room/shower room and WC are on 1st floor along with 4th and fifth bedrooms. Wheelchairs are accessible, as is the shower/wetroom, in Le Fournil (The Bakehouse), just across the courtyard from Le Moulin. Sleeps 7, (see separate listing). Shared only with Le Fournil, (The Bakehouse) sleeps 7 max. Large pool and lounging area with view of river and waterfall/bridge. 12 metres x 6 metres. Secure. Owners on site to offer support and advice if required. Tennis court 3 minutes drive down the road. Discounted rates for smaller groups. 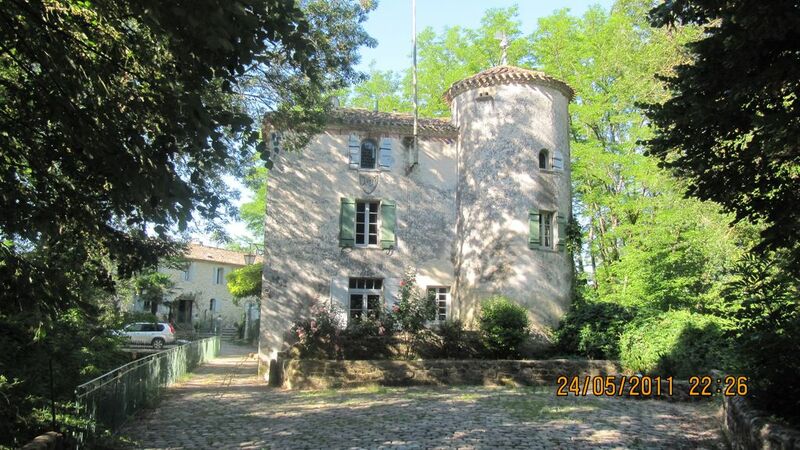 Le Moulin and Le Fournil (The Bakehouse) may be rented together at a discounted rate. Le Moulin is a magical step back in time. As you drive up the long, wooded drive to the massive iron gates, time seems to go back to another realm. Henry IV whispers bonjour from the castle tower of Le Moulin. In the back drop is the Bakers House, the residence of Le Moulin’s owners Michela and Steven, a pair of adventurous and charming Brits, who will assure your stay is both comfortable and memorable. The castle is a museum of medeval history from the 13th century. Originally a mill, the owners transformed it into a castle complete with winding stone stairs, antiques, tapestries, oriental carpets, big beds, modern bathrooms, and drapery covered windows with netting to keep the mosquitos at bay. Kids will adore playing hide and seek, or running through the surrounding grassy fields to the nearby river and back yard stone pool, built by Steven. It’s a dream come true and a perfect location to launch your daily excursions throughout the Aquitaine. We are grateful to experience both Le Moulin and it’s owners. Thank you, Michaela and Steven for a memory of a lifetime! The Mill is as stunning as the photographs depict with fixtures, furnishings and interior decoration to match the idyllic charm of the setting. The beds were comfortable and the showers/wet rooms were modern with piping hot water. The whole property is very well equipped with portable ipod speakers both by the pool and in the lounge complimented by a very large plasma satellite TV (English channels showing the rugby!). The kitchen is has all the modern conveniences alongside a medieval dining room - brilliant! Waking up and opening the shutters to look out through trees to see horses and chickens milling about in the early mist (before the wonderful heat arrives) made the whole setting feel idyllic. But Michaela and Steve made us feel very welcome - encouraging the canoeing, the cycling, the fishing and free use of the outdoor bbq facilities to ensure we had a great time. They were unfussy, unobtrusive, helpful and kind; making us feel relaxed, comfortable and more like friends than guests. You are very tucked away here and nipping to the nearby Lidle/Intermache is a 20 minute trip to La Reole. We were truly in awe of this magical property. The mill takes you into an alternative historical reality with every room having its own exquisite, individual qualities. Great care has been taken with the fittings and furnishings and it's very clear that restoration of it was not just a renovation to make it habitable, but a carefully crafted and artistic work of love to make this building 'work' again replenishing the spirit of visitors today - just as it must have replenished the lives of people years ago when it was a functioning mill. Despite the unseasonable weather for our (all too brief - one week) visit, we revelled in its atmosphere and did manage (between us) to use many of the facilities available. Our particular favourites were the canoeing and swimming, but they were probably eclipsed by the facility to relax and lounge around in truly palatial comfort (...everyone deserves it at least once in a lifetime..!) in each of the many rooms. Naturally we did visit other places in the region and we were particularly fond of Monsegur (the Wednesday night market is a bustling music-filled social event), La Reole (excellent historical walk overlooking the Gironde - while you're there check out the houses of the Black Prince and Richard the Lionheart...) and, of course, Bordeaux and the Arcachon coast. Once the adjacent field and pathways to the river and the riverside picnic area have matured, the mill will have an even more superb setting: I do envy those visitors who will come later to see the full flourishing of this last phase of the whole project! I can't finish this review without praising the warmth and un-pretentious qualities of our hosts: Michaela and Steve (not forgetting the able assistance of Brendan and Andy!). Nothing was too much trouble for them and their discreet and helpful manner - added to the unique qualities of the building - made the overall experience one we shall definitely treasure as being a distinctly special holiday. Tony, Ei, Antonia & Kirstin. Nestled in The Valley of The River Dropt' Le Moulin offers wonderful seclusion and proximity to nature and yet is only 50 min drive to the elegant city of Bordeaux via the nearby motorway. Nearby Monsegur and Sauveterre are just two of the many Bastide towns with their historic buildings dating from medieval times when Aquitaine belonged to the Kings of England. Châteaux and vineyards abound where wines can be tasted and purchased, the most prestigious possibly being the picturesque town of St Emilion with its haute cuisine restaurants and Grand Cru vineyards.The Canal Du Midi, (of Rick Stein's 'French Odyssey', is just down the road. Just on the edge of 'Cathar' country, (Marmande is 30 km south),Toulouse Lautrec's Chateau Malrome, is close by. Picturesque Lake Hostens with swimming, peddle boats and cafes is 1 hour away on the way to The Bassin d'Arcachon. Golf: La Vigier Château Hotel, Restaurant and Golf Club.